The trees are losing their fall color, the leaves are gradually, gracefully falling and Autumn again is passing too quickly. It was a matter of relaxation and appreciation that a short early morning road trip through these hills provided. The beauty shown from the early morning sun shining against the eastern slopes of the hills is just a perfect sight when starting a new day. Saturday, November 2nd was the beginning of Veterans Week in Branson. I know of no place that honors America's Veterans as much and as often as Branson does. The shops downtown were packed with visitors, the cafes filled with couples and friends. The merchants were happy as well. The 79th Annual Veterans Day Parade & Ceremony completed the week long festivities on Veterans Day, 11/11/12. Many of the shows will re-open after Christmas leading up to a New Year's celebration and New Years Eve offers great choices for ending 2012. 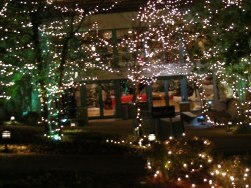 Christmas Lights: I noted on the Branson 2012 page some information about the Christmas light tours in Branson. For a real Christmas feel, I would recommend the "Christmas on the Trail" dinner show at Shepherd of the Hills Pavillion followed by a drive through the Trail of lights. Check out the video on the Christmas Shows page. This will make a great evening. Andy Williams passed away on September 25, 2012 ending 20 years atop the Branson Entertainment scene. Andy meant a lot to Branson and especially during the Christmas season. Andy loved Branson and Branson loved Andy. Sparing no expense, Andy built a truly magnificent theater in 1992. Branson's Ozark Mountain Christmas took off with the arrival of "Mr. Christmas" and the common slogan was soon heard that Christmas in Branson begins when Andy says it does. And that was usually around November 1st with the "Andy Williams Christmas Show". Big plans are in store for 2013 at the Moon River Theater and a list of performers will be presented in the next few weeks. It has been announced that one of the shows during the 2013 Christmas season will be the International Irish singer Daniel O'Donnell. O'Donnell has been visiting and performing in Branson with sold out shows since the 90's and is performing this Christmas season at the Branson Events Center (the old Tri-Lakes Center). O'Donnell is a mega star in Ireland and Great Britain and has a fan base that travel all over the country for his performances. With dozens of entertainment awards and top singles and Albums under his belt, Daniel will bring a great performance to the Moon River Theater. If you've been to Branson and stayed in a condo or RV Park, you've probably shopped at the Jubilee Grocery Store on Hwy 76. This is the store next to the Branson Mall and the Walmart Store. The store was heavily damaged in the February 29 tornado and has just announced they will rebuild a "state of the art" store to be opened by next spring. This will be a relief to both locals and travelers due to the convenience of the store. Barry Williams, star of the Brady Bunch television series is ending his second year with his show the "Brady Brunch" at Yakov's Theater. Barry is moving to RFDtheTheater with a new show called "Totally 70's Music Explosion", a trip back in time with singers, dancers, a live band and a multimedia presentation. 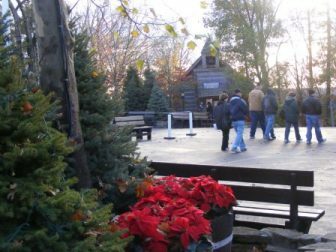 Yakov's theater will be closed next year until Yakov returns for the Christmas season. During the year,Yakov will be touring with his new show "Happily Ever Laughter" the theme of which is about marriage. Yakov has been developing the show for the last 12 years. You might be surprised to know that Yakov is a professor of Psychology at Missouri State University in Springfield. He will continue to reside in Branson. If you are a fan of RFDTV, then you are likely familiar with the shows "Larry's Country Diner" and "Country's Family Reunion". It was a great surprise this fall that Starlite Theater announced a partnership with these programs to present a series of performances of country music's legends. I won't go through the whole list of performers who made their way to the Starlite Theater this fall but we certainly hope that this will be an annual event. We'll let you know when we know. The Branson Variety Theater reopened on November 1 after renovation from the tornado damage. The Theater will now be named King's Castle with an all new look. Christmas shows include "Christmas in Hollywood", "12 Irish Tenors", and "A Tribute to the Four Seasons and the Beach Boys". The Radisson Hotel located behind Andy William's Moon River Theater has completed a 5.5 million renovation that covered all aspects of the hotel. The Time Out Sports Lounge, located in the hotel has also been renovated. This was a scheduled remodel and was not due to tornado damage. That's it for 2012. I hope you are able to make it to Branson's Ozark Mountain Christmas, but if not, 2013 is sure to have a lot in store for the visitor. I'll try to keep you up to date with new news from Branson, MO. You'll hear from me when we have some information about the 2013 season.